On January 1, 2017 – and with camera in hand – I kicked off the New Year off with a bird walk at Richard W. DeKorte Park in the Meadowlands, located in Lyndhurst, New Jersey. This park is most definitely a birders paradise – replete of wetlands, salt marshes, several large impoundments (enclosed bodies of water), tidal mudflats, and an upland forest habitat. Another sensational feature of this locale is that it is located along the Atlantic Flyway -a major migratory routes used by birds. And an added plus – this DeKorte nature preserve is juxtaposed with a view of the New York City skyline. I was thrilled to actually see the Lapland Longspur (Calicarius lapponicus), which, for me, was a lifer (when a birder sees a bird for the very first time), as well as for many other birders. 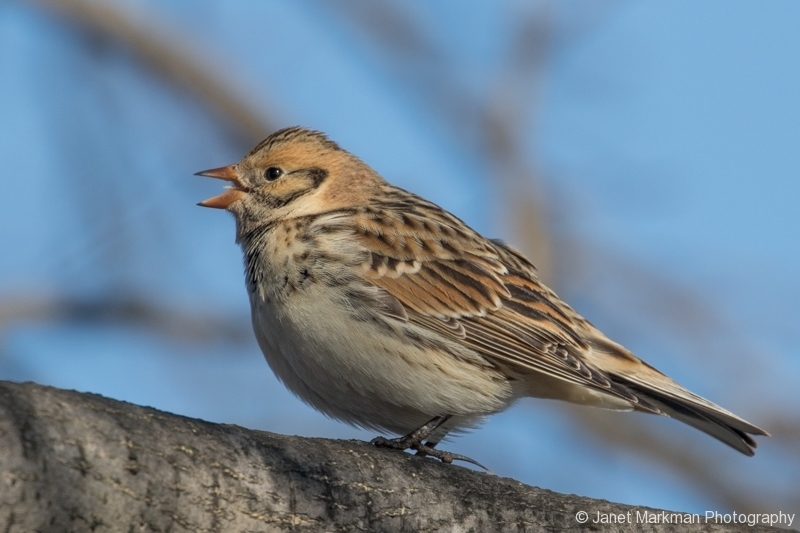 The Lapland Longspur was foraging on the ground with a small flock of Song Sparrows (Melospiza melodia), occasionally flying up to a nearby tree to perch, singing its song, and flying back to the ground to feed. The name Longspur refers to the long claw on the bird’s hind toe. 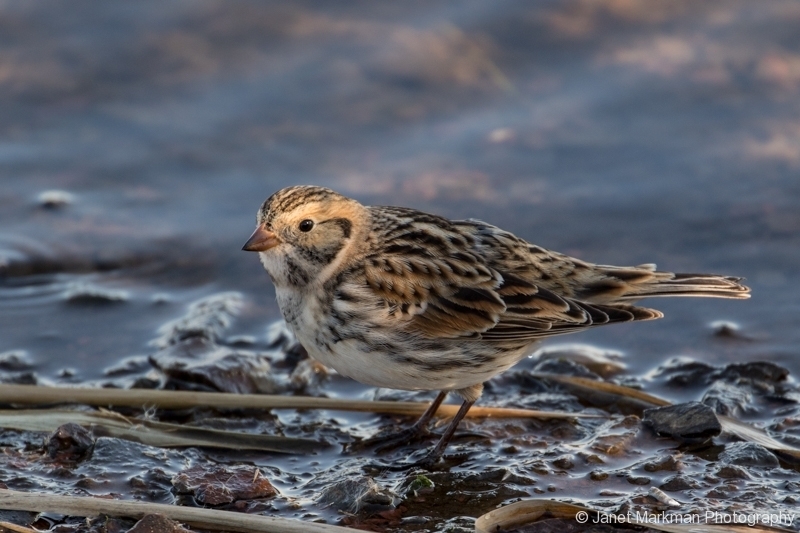 The Lapland Longspur is a common songbird of the Hi Arctic Tundra which winters in the United States primarily in large flocks across the Great Plains all the way to Northern Texas, but is relatively uncommon in Eastern North America and West of the Rockies. This bird’s preferred winter territory is quite varied: open fields, plowed fields, planted fields, open grasslands, prairies, and shorelines. The Lapland Longspur is normally a ground forager, feeding on the seeds of grasses and other plants, but in the summer their diet may also include vertebrates. The winter season is an excellent time to observe ducks. I was at DeKorte during high tide and was overjoyed to identify eight species of duck as I was walking around various impoundments : Gadwalls (Anas strepera), American Black Duck (Anas rubripes), Mallards (Anas platyrhynchos), Northern Shoveler (Anas clypeata), Green-winged teal (Anas crecca), Canvasbacks(Aythya valisineria), Hooded Mergansers (Lophodytes cucullatus), Buffleheads (Bucephala albeola) and Ruddy Ducks (Oxyura jamaicensis). These ducks, with the exception of the American Black Ducks and Mallards, are winter residents who will breed further North. Many male ducks (drakes) have gorgeous colorations, a few of which I will highlight. 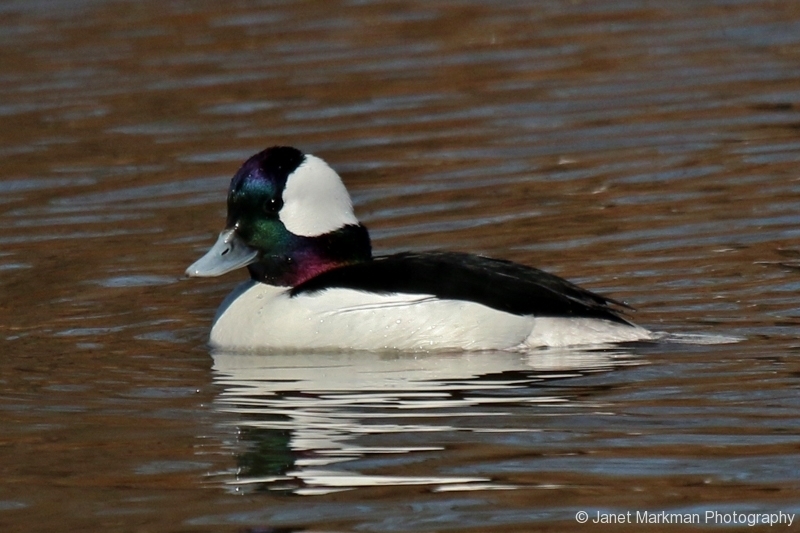 Male Buffleheads are striking black-and white from a distance but, a closer look at the head shows shimmering green and purple fluorescence around the white patch on its head. 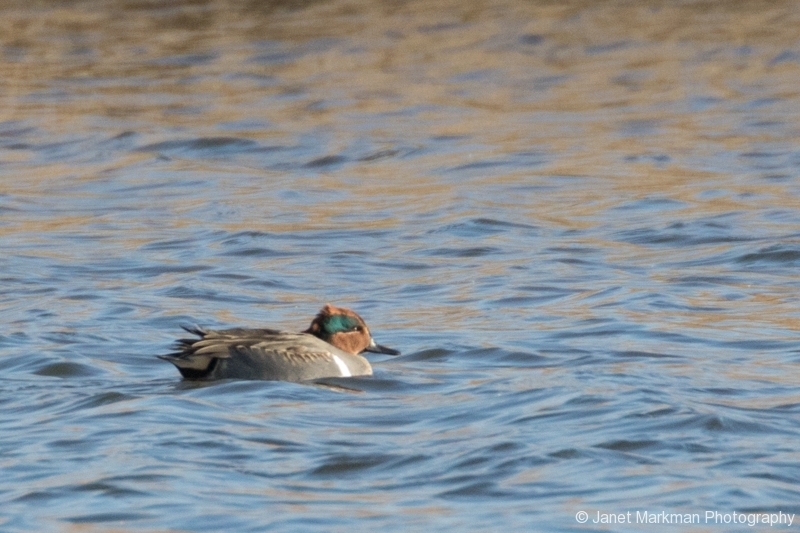 The Male Green-winged Teal has a cinnamon-colored head with a gleaming green stripe from its eye to the back of the head. 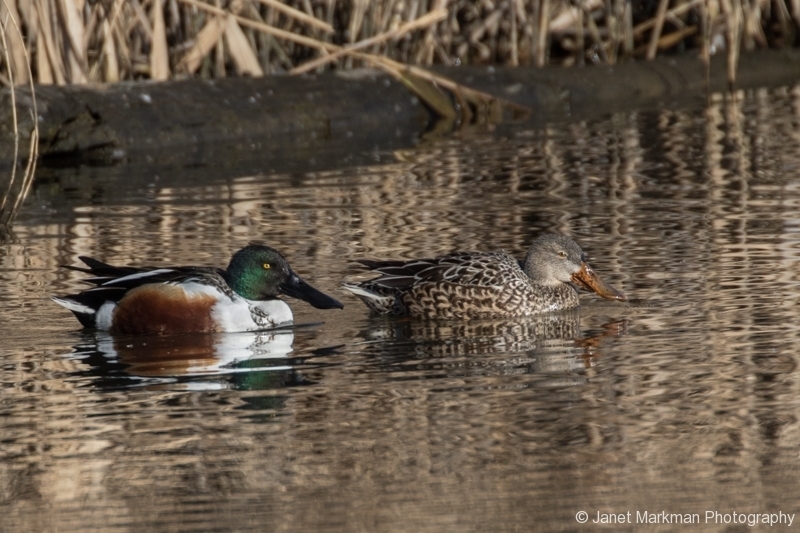 The male Northern Shoveler has a fluorescent green head with a black, white and chestnut colored body. Another distinctive feature of this duck is its very large bill that is wider at the tip, with comb like projections along its edges, which filter out food from the water. 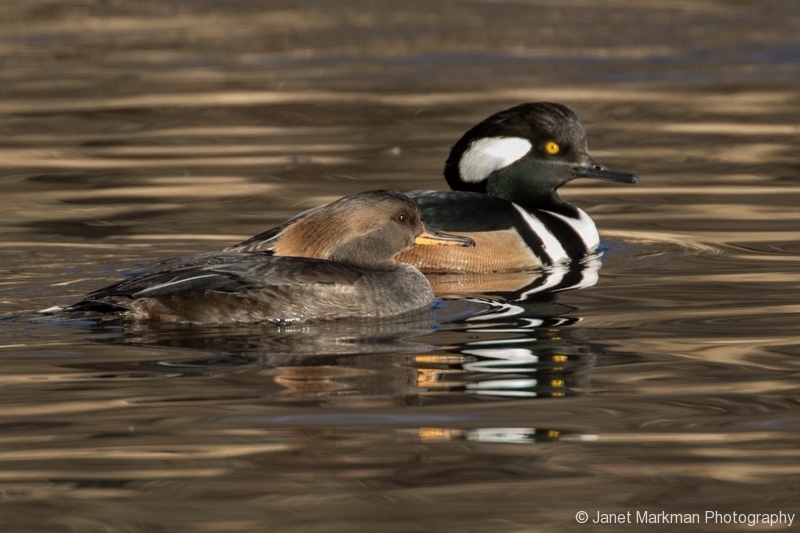 The Hooded mergansers are also very striking: the males with sharp black-and-white patterns set off by chestnut flanks, and the females with their distinctive yet elegant cinnamon crests. During this expedition, a Great Blue Heron (Ardea herodias) and an American Krestal (Falco sparverius) flew overhead. A somewhat shy Pied-bill Grebe (Podilymbus podiceps) was hiding in the Phragmites, but cautiously came out and swam into open water. I ended my walk in the upland forest where, I spotted a Fox Sparrow (Passerella iliaca), along with many White-throated Sparrows (Zonotrichia albicollis), Dark-eyed Juncos (Junco hyemalis), House Finches (Haemorhous mexicanus), a Downy Woodpecker (Picoides pubescens), a Red-bellied Woodpecker (Melanerpes carolinus), and a Northern Cardinal (Cardinalis cardinalis). DeKorte is a perfect haven nature-lovers and birders as it always has a wonderful variety of birds, no matter what time of year you visit. Summer time is an ideal time to observe many species of wading birds, especially at low tide, while the Spring and Fall seasons are opportune for viewing many migratory birds who make their appearance along the Atlantic Flyway. Richard R DeKorte Park is certainly worth repeated visits as one never knows what (or who) will show up – such as the male Ruff (Philomachus pugnax) I encountered last summer. Again, this is one location I highly recommend visiting if you seek to develop a deeper connectivity with and appreciation of our natural world. This entry was posted in Birds, Nature Preserves.